Our report on this put it into context saying that it took place just a mile from the Israeli border and was a message from Hamas about its strength confidence and future fighters. Oh and that the brides were elsewhere. Pretty straightforward. It never struck me for a moment that the little girls might later be described in the bloggersphere as the brides! How naive I am. Dozens, and I mean dozens, of websites took the video of the event and wrote lurid stories about Hamas mass paedophilia with headlines about ‘450 child brides’, and endless copy about how disgusting this was, how it showed how depraved Islam is, et al, ad infinitum. Site after site jumped on the story, linking from one totally wrong load of rubbish to the next . I’ll give credit to Tundra Tabloids who at least took down the video, but most sites just ploughed on regardless. I spent a few hours visiting websites and leaving comments where I could. To little avail. Instead I received a steady stream of vitriol. The best response was on a site run by a Debbie Schlussel . The guy who posted it said he wasn’t interested in the detail. The detail being the fact that the girls weren’t the brides. It showed how much some people want to believe nonsense like this, as it re-inforces their prejudices, always a comfortably fun thing to do. But Hamas, and the jihadists do enough terrible things without having to make things up about them. Most of the stuff I read was outright, unthinking, gleeful, Islamophobia from people who clearly knew nothing about Arab popular culture. It’s as is they really believe that because there are examples of child brides, it means all weddings are with child brides. Some sites went so far as to complain that the mainstream media were complicit in paedophilia because they had reported the mass wedding but failed to mention that little girls were about to be raped that night. And so it went on, and on. Perhaps I was making up the fact that the brides were elsewhere. It’s possible. But who would you believe, the reporter who went to the event, or a desperately poor version of citizen journalist, sitting at home, making things up, not checking anything, and either unknowingly or deliberately, writing hysterical anti Islamic nonsense. The second article by Loonwatch includes a photo to help you visualize this event more clearly. The many websites that picked this up have responded in various ways: some issuing corrections, some quickly deleting their postings, and some insisting that it’s all true and that Marshall is trying to cover up the fact: “Why”, demands one site “would Tim Marshall defend the Gaza pedophiles?” One of the sites that decided to scrub was Robert Spencer’s Jihad Watch, which is worth noting as Spencer claims some sort of academic expertise on Islam. 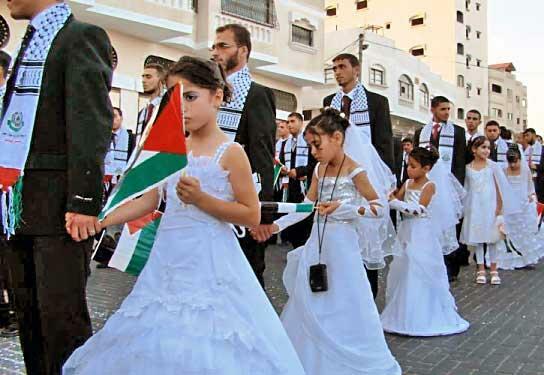 Of course, we know that child weddings do occcur in the Islamic world, but the idea of a mass child wedding becoming the focus for popular public celebration in such an urbanized environment as Gaza should have evoked some scepticism. Even WorldNetDaily has - grudgingly -debunked the tale. The “argument” goes that Muslims believe Muhammad to be a perfect model for behaviour and therefore the fact of Muhammad’s marriage to A’isha somehow proves Islam to be a depraved religion. That no good can come of following it etc etc ad nauseam. This attempt to aggressively apply a modern British definition of paedophilia to seventh century Arabia strikes me as a sign of severe anthropological illiteracy; but the right to express such offensive, anthropologically illiterate statements must be defended staunchly. ... Which is probably why nearly all Muslim countries have reformed these rules beyond recognition. The age of consent in Algeria and Malaysia is 16, in Indonesia it is 19 for males and 16 for females. In Egypt it’s 18 for both and Tunisia 20. Reform has not, however, come to Saudi Arabia. Back in April the world followed the case of a mother trying to obtain a divorce for her eight-year-old daughter who had been married off by her father to a friend he owed a debt. In the end she succeeded and now there is even talk of Saudi Arabia preventing marriage before the age of 18. Muhammad’s marriage to A’isha would logically only be of real concern to a non-Muslim living in 21st century Britain if Muslims were, following his model, regularly involved in child marriages. But, apart from possibly in Saudi Arabia and Iran, they aren’t. If your claim is that Islam is fundamentally depraved because Muslims seek to emulate Muhammad and he married a six-year-old, then it is entirely shot down by Muslims not emulating Muhammad on this matter. But people like “Old Peculier” and “kafuruk” are not concerned by this. They just want to level two of the most heinous accusations thinkable at Muhammad because he is respected by Muslims. It’s stupid and designed to offend but, if people really want to prove their idiocy in this way, then they must be entitled to do so. Not because it’s A Good Thing that people accuse Muhammad of paedophilia, but because defending their right to make such statements is the best way to defend those who would publish books like ‘Jewel of Medina’ and ‘Does God Hate Women?’. However, no matter how many times such stories are debunked, they will continue to turn up for years, and be referred to as examples of just how disgusting Muslims really are. This, like so many incidents that never happened, or are misrepresented just won’t go away. No matter how often they are debunked, or how tenuous the connection with reality, they just keep coming back. This morning I received an email that is circulating under the heading “Muslim Sickness” which recycles this lie once again complete with the same photographs and a false news story. It seems that I was correct in my original assessment that such stories would continue to turn up for years, and that some people are so anxious to prove that Muslims are inhuman savages that they will believe anything negative without even doing a simple fact check. This is Islamophobia pure and simple and doesn’t reflect well on those who continue to promote such propoganda.